Nowadays genetic potential of monogastric farm animals allows the animals to grow faster by using less feed. To perform up to this genetic potential the nutritional quality of the diets needs to meet the animal’s requirements. Particularly the diets fed during the first phases in the animal’s life are very important. 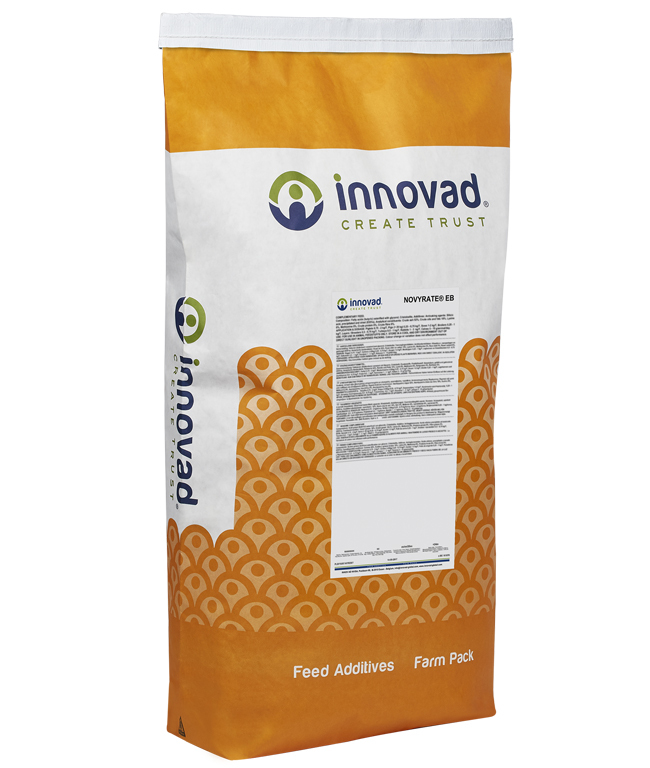 First phase feeding will have a significant impact on the intestinal bacterial community and the development of the intestinal structure, integrity and functionality. A sub-optimal intestinal functionality during this first phase has a significant and negative impact on the animal performance up till the end of the growing period. In order to maximize the genetic potential of the animals, Novyrate will act as an essential nutrient for the development and maintenance of digestive functionality and integrity. Butyrate has mainly been used as a direct energy source. Research has now produced evidence that specific metabolic effects can be attributed to butyrate making it an important and useful metabolic molecule in animal feeding. Stimulating function of liver cells. Stimulate the ability of the animal to overcome bacterial infections. Slow down the emptying of the stomach/gizzard to optimize feed passage. Increase the absorption of electrolytes and water, providing dryer manure. Decrease the adsorption of ammonia, thereby reducing the toxic effects in the animal. The same type of receptors is found in spleen, bone marrow and monocytes, suggesting that butyric acid will affect positively the immune system as well. Many research work as well as field experience have demonstrated the beneficial effect of using Butyrate combined either with other organic acids and/or essential oils and botanicals. Such combinations can prove to be more effective than using any single material alone. Butyric acid is most active when it reaches the lower parts of the intestinal tract, ensuring the animal benefits from its antipathogenic as well as its additional metabolic and physiological effects. Encapsulated butyric acid is therefore preferred over the uncoated one. This not only prevents odor, but also helps to ensure that butyric acid is released at the right place and in a sustained manner. The encapsulation - also known as coated butyric acid - travels down the gut line and gets released gradually in the small intestine. The secretion of lipase in the beginning of the small intestine allows the gradual release of the organic acids throughout the digestive tract, but especially in the small and large intestine. It makes a sustained and slow release till the hindgut of the intestines. The next generation of this molecule is esterified butyric acid. Esterifie­­d butyrins are combined molecules of glycerol and butyrate where the end product is mono-, di- and tri-esters which act as a source of butyric acid, with the help of lipase. They do not require coating and can pass through the upper gastro-intestinal tract to release butyric acid in the small intestine, after separation, with the help of pancreatic lipase. Due to the similarity with tri-glycerides, these esters also bypass the stomach and the end result is like that of a coated butyrate. Unlike organic acids, esters are not pH dependent. Either of the two variants of butyric acid – Coated Sodium Butyrate or Esterified Butyrin serve as a good substitute for antibiotic growth promoters (AGPs). In today’s highly genetic potential of production in birds, coupled with restricted usage of antibiotics - these multifunctional molecules serve as a boon to the industry. The critical factor is the form in which butyric acid is being supplemented. This will determine the profits it will carry, right from the start till the end of rearing. Novyrate is a pure form of Sodium Butyrate. Novyrate C is the coated butyrate product that, through its’ slow release coating process, gives the animal the possibility to develop an optimal functioning intestinal tract. This enables the animal to get the maximum out of its genetic potential. Novyrate S is a product which combines the slow release coating process with a mixture of other organic acids targeting microbial imbalances. Novyrate EB Gut-active (esterified butyrins) is a synergetic combination of esterified butyrins, with immediate activity in the early part of the intestinal tract.